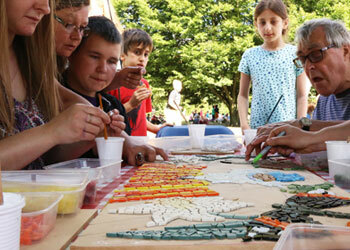 Leona facilitates the creation of large scale Artworks that the whole of your Community take part in making. Your group can choose from a 2D or 3D Artwork for your indoor or outdoor space. Cost depends on the size/time scale of the project and if the Artwork is required for indoor or outdoor display. 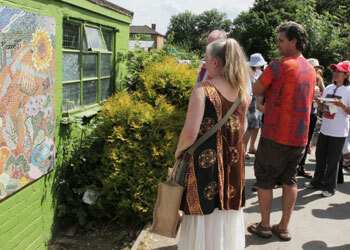 Leona has experience in Making Public Artworks for all kinds of sites: in Schools, on Public Walls and Private Spaces. She can design a piece for your community to help create and help facilitate the making workshops – right through to installation. Promotes your commitment to community, inclusion and participation. Transforms a dull space into something more vibrant and exciting. Helps create a sense of place, connection and ownership. Helps people to feel included in something bigger than themselves. Helps people feel a sense of pride and ownership in something they have created. 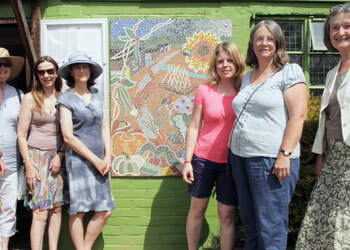 Please email Leona for more information about making a Community Artwork for your site. 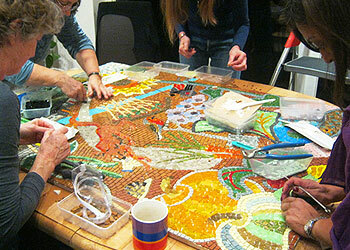 A group of us have been making a mosaic to put on our community allotment building. Leona welcomed all our ideas of what should be in the picture and with everyone chipping in, she drew a fabulous outline ready to be filled in with mosaic tiles. Over the weeks different people have joined in the sessions, and Leona instantly makes them feel part of the group.She is so friendly and welcoming and she values everyone’s contributions, even those of us who feel we haven’t a creative bone in our body! 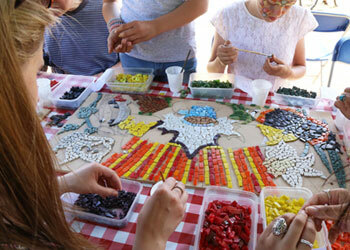 Liz, Community Mosaic Art Participant. 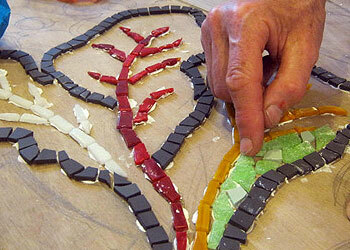 Judy, Community Mosaic Art Participant. An amazing NEW Public Artwork for Muswell Hill! The Official Unveiling of the Muswell Hill Mosaic took place on 3rd December as part of the “Very Merry Muswell” event in St James Square. Thank you to Rowland Rivron and Peter Tompson for their wonderful speeches. Thanks to everyone who took part – whether you place 5 tiles or 50 tiles, you made it happen! This project was self funded. You can still help assist by donating using the yellow button below. Your contribution takes immediate effect and is received with appreciation.